Description: Broccoli is a strong growing biennial cole crop. Grows up to 50 cm. It has a large, green, tree-like flower heads springing from the thick stem. 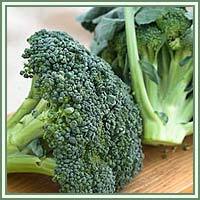 Medicinal use: Health benefits of broccoli are enormous. It has twice as much vitamin C as spinach and as much as lemons, thus being an excellent support to our immune system. Broccoli has antioxidant and anticancer compounds. Recent researches have shovn that broccoli contains sulforaphane, a substance which could protect us against the risk of cancer occurring, and reduce the severity of cancers that do occur. Broccoli also improves body's detox process, and can lower cholesterol levels, prevent heart disease and lower the risk of certain birth defects. Still, it should be noted that the benefits of broccoli are significantly reduced if the vegetable is boiled. 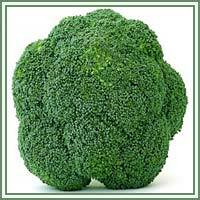 Safety: Cruciferous vegetables, like broccoli, contain chemical compounds, goitrogens that inhibit the formation of thyroid hormones. These chemicals are not hazardous for healthy people, but they could pose problems for people who have thyroid problems or are taking thyroid medication. Broccoli also contains peroxidase, which may produce a false-positive test for occult blood in the stool in people who do not actually do not have it. Some herbs could react with certain medication. Therefore, it is advisable to consult your doctor before consumption of any herb.